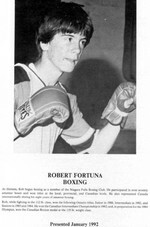 At thirteen, Rob began boxing as a member of the Niagara Falls Boxing Club. 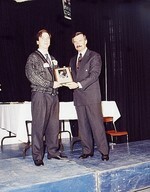 He participated in over seventy amateur bouts and won titles at the local, provincial, and Canadian levels. He also represented Canada internationally during his eight years of amateur boxing. Rob, while fighting in the 1121bs. class, won the following Ontario titles; Junior in 1980, Intermediate in 1982, and Seniors in 1983 & 1984. He won the Canadian Intermediate Championship in 1982 and in preparation for the 1984 Olympics, won the Canadian Bronze medal at the 119 lb. weight class.